The key to a successful business is the reach of that business to their respective future and current customers. If you are failed to do that, that means you are incapable of growing your business. To give your business a boost all you need is a platform, a platform where people are active, who can see your business. The one platform to advertise your business is Google which you can say with no doubt, but what else! there should be an alternative option always, and that option with the most active audience is known as Facebook. Using Facebook you can give your business a boost for your specific business area(City, State, or Country) using facebook advertise options. To advertise your business on Facebook you need a Facebook page. Maybe you already have a facebook page, but managing facebook page is also a task in itself. To get the proper analytics of your business campaign through your facebook page, you need to check it often. Sometimes a single person is not available to manage a Facebook page and that time you need to add a moderator to your facebook account or make someone admin on facebook page who is resposible to do that task of managing the facebook page. Making more than one admin increases the authority of page and other admin of that page can make the same changes and can control page as much as you can. You can follow below steps to know how you can make someone admin on your facebook page. 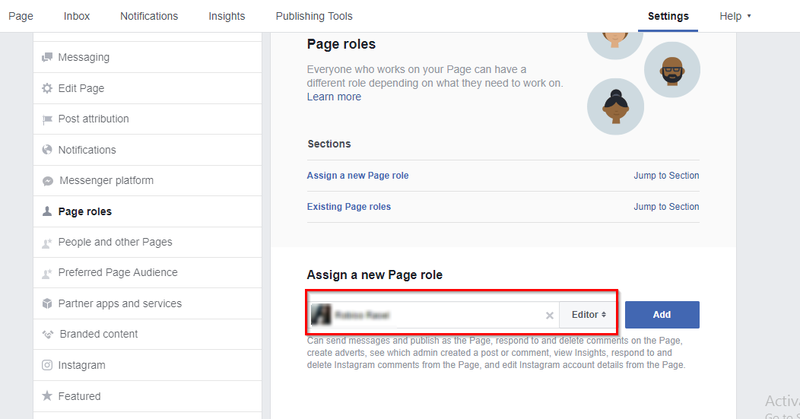 Before going through below steps that this demonstration of making someone admin of business page will work for other pages too, so you can make someone admin on your fan page or other category page too. Login your facebook account in which you have your facebook page. Open your facebook page using your admin account. Click on Settings from the header section of page. On the next window, click the Page roles option from the left-hand side of the window. Under the Assign, a new Page role, type the name or email of that person you wanted to set as admin. Now click on the button given inside the box, and choose the admin option from the list. Now hit the Add button and you are done. Once you are done with above steps you will be given admin authority to another person. That person will also be able to make changes on that facebook page. If you want to add someone as a moderator or contributor on your page then you can follow the similar steps and instead of choosing the admin option from the list, you can choose moderator or contributor whatever you want.